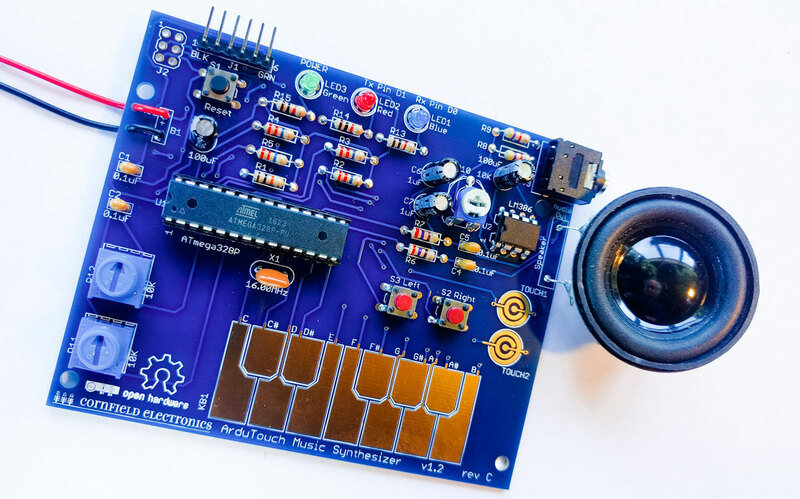 TV-B-Gone inventor Mitch Altman's rad new $30 DIY Music Synthesizer! As a kid with a lust for music, I was rocked by the Moog synthesizer sounds of 1968’s Switched-On Bach. I needed to learn how to make those sounds! Thus began a lifetime of learning and synthesizer making while I made my way in the tech industry, where I ultimately created the TV-B-Gone, a gadget that lets you turn off almost any model of remote-controlled television. Since the popular success of the TV-B-Gone, I’ve created many fun, open-source, hackable hardware kits for the maker workshops I give around the world. In these workshops, newbies learn to solder, tinkering their way into electronics and microcontrollers. Remembering my own youth, I wanted to provide them with a kit that was simple to assemble [PDF] and use but still a fully fledged music synthesizer. The result was the US $30 ArduTouch. This project incorporates, on a single board, a touch keyboard, an ATMega328P (the same processor used in the Arduino Uno), and an audio amp with a speaker. It also has a software library that can serve as an entry point into the world of digital signal processing.